Editor’s Note: The author’s use of unqualified place names in the disputed territory of Nagorno-Karabakh is a reflection of his analytical perspective, and does not necessarily represent the official view of EDSN, CSS, or its affiliates. The velvet revolution in Armenia was a political earthquake which few had anticipated. In less than a fortnight, the popular movement led by Nikol Pashinyan managed to mobilize the overwhelming majority of Armenian society in a dramatic struggle against the autocratic and corrupt regime of Serzh Sargsyan. The movement reached its initial goal on April 23, when Sargsyan announced his resignation. The following two weeks were marked by political instability caused by the reluctance of the ruling regime’s representatives in the Parliament to satisfy the protesters’ demands and elect Nikol Pashinyan the new Prime Minister of Armenia. However, On May 8, the revolutionaries prevailed and Pashinyan became the new leader of the republic. These tectonic changes in the Republic of Armenia quite expectedly had their effects on the political life of the Republic of Nagorno-Karabakh. Armenia and Nagorno-Karabakh have different political systems, but they exist in the same political space. Nagorno-Karabakh’s political system has been heavily influenced by the decisions of Armenia’s ruling elite for the last two decades. The so-called Karabakh clan, which came to power in Armenia in late 1990s, did its best to eliminate any kind of political autonomy in Nagorno-Karabakh and keep it under control. For many years, Yerevan was the single biggest barrier to democratic transition in Nagorno-Karabakh. In 2007, NK’s incumbent president Bako Sahakyan was handpicked by the ruling elite in Armenia and won his first presidential elections by a landslide. Sahakyan became one of the main pillars of Serzh Sargsyan’s regime. During the years of his tenure, he created a centralized system which sought to suppress even the slightest manifestations of political dissent. In 2017, when his second presidential term was coming to an end, Sahakyan, encouraged by his patrons in Yerevan, changed the republic’s constitution to stay in power for an indefinite period of time. In July 2017, the NK parliament elected him president for a third time in a row, finalizing his ‘constitutional coup’. However, after Sargsyan’s fall in Yerevan, it became clear that Karabakh’s political stability was also at risk. The wind of change was in the air. Sahakyan no longer seemed all-powerful who could get away with beating up political opponents or using other repressive tools. On June 1, a quarrel between two citizens and an officer of the National Security Service (the former KGB) turned into a mass brawl when a group of servicemen from the NSS’s special forces unit came to the help of their colleague. The two civilians were severely beaten for several hours. The police didn’t dare to interfere. Soon after that incident, dozens of people blocked Stepanakert’s main street, demanding to punish the servicemen involved in the brawl. On the next day, the street was again blocked. Hundreds of protesters gathered to speak out against state violence and brutality. A coordination group was formed which demanded the immediate resignation of the chief of Police, the head of the National Security Service and his deputy. The street remained blocked for several days until the protesters’ demands were met. The above-mentioned officials resigned and Sahakyan promised to implement systematic reforms in the country. However, this was just the beginning of a hot political summer in the republic. There was a general understanding that the president’s promise about systematic reforms was just a bluff. New cases of police brutality soon emerged. But the issue of legality of Sahakyan’s presidency was the elephant in the room. Both the old and the new constitutions of Nagorno-Karabakh explicitly say that no person can be elected president more than twice. That’s why several opposition parties and groups leaped at the chance to use the momentum of Armenia’s velvet revolution and launch political movements, demanding Sahakyan’s resignation. 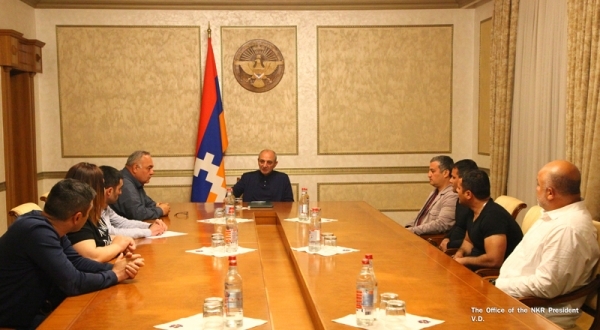 A number of rallies were held in Stepanakert throughout the summer, but the opposition failed to mobilize the critical mass capable of ousting Sahakyan from his office. He has survived the period of political turbulence for the time being. Nagorno-Karabakh hasn’t managed to follow in Armenia’s footsteps because of certain objective and subjective factors. In stark contrast to Armenia, Nagorno-Karabakh’s civil society is very weak and passive. All the resources in the country are either owned or controlled by the ruling regime. This makes the emergence of independent organizations and media outlets nearly impossible. Local actors have very limited access to foreign funding because of the political isolation of the unrecognized republic. The overwhelming majority of the existing organizations in the field are quasi-patriotic GONGOs which serve the interests of the ruling elite. The population itself is mainly employed by the government and the threat of job loss is still a major deterrent to political action. The velvet revolution in Armenia was made possible through a decades-long struggle of the civil society for the expansion of real political rights and civil liberties. Numerous student, environmentalist, and other civic movements generated the activist core which eventually became the driving force of the revolution. In Nagorno-Karabakh, the opposite happened. During the years of Bako Sahakyan’s rule, the country submerged in political and civic stagnation. Any kind of political activism was discouraged. Another major problem during the summer protests was the absence of a high-profile leader who could pose a direct challenge to Sahakyan’s presidency, which made it much harder to recruit supporters. From my perspective, thousands of NK citizens agree that Sahakyan had to go, but the lack of clarity about the future likely kept them from joining the protest movements. This also was the result of a system which eliminated political competition in the republic. The ruling regime in NK managed to co-opt all the charismatic opposition leaders, creating a vacuum in the field. The void was filled by young activists, who had much lower profiles and less influence. In a patriarchic society like Nagorno-Karabakh with a traditional political culture, people mainly follow strong and experienced leaders. The fact that different groups demanding the president’s resignation didn’t manage to join their efforts and coordinate their actions was a big bonus for the ruling regime. A united front against Sahakyan could have been more successful, but the lack of trust among these groups and differences in their agendas prevented cooperation. Nevertheless, it would be wrong to say that these movements were complete failures. They didn’t manage to reach their declared goal and topple the president, but in the midst of the protests, Sahakyan made a public statement vowing not to run for office in 2020. Another important achievement of the summer protests was the liberation of the public space. The protesters started a very important process of turning Nagorno-Karabakh’s streets and squares into venues of political action. As a result of this, the government had to hastily adopt a law on freedom of assembly which hadn’t existed before. A new culture of protest has been emerging in the republic. People feel freer than ever to voice their concerns publicly and make the authorities more accountable to the public. And It is apparent that Nagorno-Karabakh will sooner or later have to match the high standards set by Armenia. Tigran Grigoryan is an EDSN Fellow as well as a founder and leading member of the National Revival Party, an opposition party in Nagorno-Karabakh. A frequent political commentator, analyst, and activist, he is regularly writes on regional politics, democracy, and democratic transitions. He holds a master’s from the University of East Anglia, where he was a Chevening Scholar. Previous Previous post: Brexit and the Eastern Partnership – opportunities as well as risks?